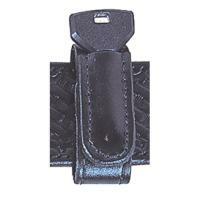 Stallion Leather is a name renowned for their expert craftsmanship, informed design and quality duty gear. Many of their products employ a "French Edge" sewing technique, creating a sleek and lightweight silhouette. Stallion's 1" wide belt keeper is fashioned from top-grain leather, providing lasting durability that will withstand everyday activities. This indispensable accessory makes use of a hook and loop closure and pairs well with Garrison style belts, or Sam Browne duty belts up to 2 1/4" wide. A spare key slot offers added functionality. This item is manufactured in the USA, using all-American made materials.